What, where, when? All details required! Intriguing that this one remains unresolved. My initial thought when I first saw it was, how about Mochdre — between Colwyn Bay and Llandudno Junction? I will leave that for you learned chaps to ponder! Strange. Faded lined livery, but no nameplate or numberplate, and no evidence of them formerly being in place. Is this a “spare” Engineer‘s loco? I’m sure Jim is correct, it’s a ‘Spare Engine’ - see Fig. 59 in John Goodman’s invaluable ‘L&NWR Locomotive Names’ (RCTS, 2002). From the state of the engine, the lack of any trace of the former ‘Engineer’ plate and the look of the driver, I’d guess it was ex-2157 ‘Unicorn’ which was the spare engine from 1905 to 1923. The location is Platform 4 at Llandudno; the background houses can be seen in plate 179 in Anderson & Fox: ‘An Historical Survey of Chester to Holyhead Railway Track Layouts & Illustrations’ (OPC, 1984). I really don’t know Jim, but it seems that the Engineer’s Dept ‘Spare Engine’ carried no obvious identification plates. But from these two photos - at Llandudno and (in John Goodman’s book) with a well-filled tender at some shed somewhere, next to an 0-8-2T - they must have done some work. The caption to the photo of ex-‘Vampire’ is slightly misleading: it actually became ‘Engineer’ in May 1897 then ‘Spare Engine’ in May 1923. Thanks for that Harry. 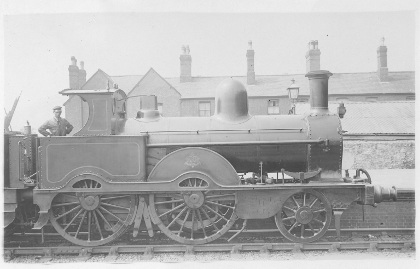 There is also a photo of “Unicorn” as Spare Engine on P107 of Ted Talbot's “An illustrated History of LNWR Locomotives” (Plate190). I think I was insufficiently clear as to my specific query, which was about the period during which each of the ten “Samsons” surviving the general replacement of the class by “Whitwort/Waterloo” engines was allotted a Duplicate Number before being allocated to “Engineers” or to “Spare Engine” duties. In the case of 2157 “Unicorn” this period, during which the loco was allotted duplicate number 3272, lasted apparently from 11/95 to 11/05 when it subsequently became the “Spare Engine”. Were such engines actually fitted with “Duplicate” number plates, and on what duties (if any) were they employed during that period? Since my original query I have noted that the 1905 edition of “A Register of all the Locomotives now in use on the London & North Western Railway” lists seven of these locomotives under the heading of “Odd Engines” at the end of the duplicate listings - but describes them as “6ft single A11 class”! The duplicate numbers given are those allotted to the “Samsons”. I’m pretty sure that any engine actually given a Duplicate number would have carried plates so numbered and would have carried on working. Those listed as having cut-up numbers weren’t given plates as they were scrapped straight away and the cut-up number was simply a book entry - in the Dup List - to keep the accountants happy. On page 119 of Baxter 2A, the engine 885 ‘Vampire’ is shown with its Dup 3269 as a cut-up, but this (presumably) is a mistake, as it became ‘Engineer’ two years later. “Spare engine (No Title) [i.e. no name], Crewe Works No 1859 ... 2157 Unicorn, Re-No 3272 (11/95)" - but then: ”Date transferred and No removed 11/01’. This “11/01” date isn’t corrected in his Supplement published in June 1924, so I’d believe it to be correct. Another misprint in Baxter, perhaps? Or...? Thanks, Jim for the reminder about the photo in Ted Talbot’s book. This seems to confirm that the Mystery Photo is the same engine, ex-‘Unicorn’. The first picture in the Society‘s Zenfolio “Samson” file also shows what appears to be a “Spare Engine”, at Rugby.